How can anybody make a living from binary options when you have dirty brokers everywhere! even if you win they will steal your money and support lying affiliate marketers to help them! Look at these two scammers and IQoption supports them as they are Russian and I bet they work for them directly! the missing green triangle shows they are not real accounts! Thumb up for Binary Options Robot. As BorisLuketz pointed it is easy to use and helped me a lot with trading and to make some extra cash. Their website also offers helpful live chat to help traders with any questions. let me get it straight, you say IQ are scammers cause there is a chick and a guy in the funny hat trading there and the dot is missing? the affiliates are scamers, no doubt, that doesn't make IQ a scam. full time trading is tough with binary options, the brokers don't like you to win too much, even the good ones. Best to have several brokers and different accounts to spread your winning around and stay under the radar. Thanks for the advice. It seems very reasonable. May I ask which platforms you are using? So far I'm not able to earn money on options, so that I'd have enough money for a good life and not have to work at another job, but that's what I'm working for. Right now I'm testing something new for myself. I don't quite understand why it's a scam. But in any case, if there's a scam with the sum, you should be more careful. I guess there are some people. It's possible! Proud Member of Investing Slack Group - an exclusive investing chat community. Trading binary options knows no boundaries. Wherever you live in the world, the basic requirements are as secure internet connection, some capital to start trading, and the drive and desire to learn about how the industry works. Yes I make living with it. Thats a very strong statement. Not all of the affiliates are scammers. 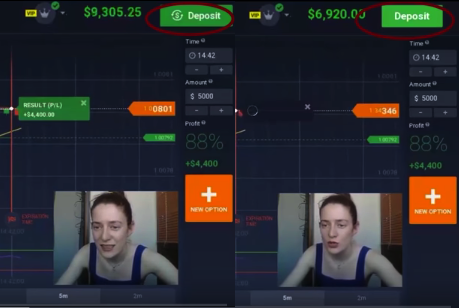 With this statement you also say that this forum is a scam too as to the best of my knowledge BinaryOptions.com is also affiliated with IQ Option. If you see that some affiliate is providing not correct info about IQ Option or violate the rules, please, let us know. Very true. The brokers do 2 things. I tell you one the other one you can Google and read. First. They play a psychology against you if you let them. Iq Option is not a scam. Actually I enjoy using brokers against each other and always have a good laugh. Second. They are OTC but of course they will not tell you. Others are ECN. If you know the difference brokers will get lesser chance to screw with you. I don't think any BO broker is ECN. Some FX brokers yes but even there far from even 5% of all brokers out there. Hi Okane, i have never come across ECN and OTC ? Have U got the time to explain to me (us) ? Well....we can all imagine who pays them to make the videos ? By the way....am i the only one with a MT4/IQoption "out of sync" problem on charts/candlestics ? Explain what exactly? What I was saying was a reply to the guy who claimed there were ECN BO brokers. And BO is not IN the market so there can't be ECN brokers lol. In FX trading there can and are ECN brokers of course. ICMarkets for example is an ECN broker I use myself for Forex trading. Means that your orders actually get sent to an actual market and not being traded inside the broker = market making. I hope this explains. Nowhere near, but it's my goal. Of course many traders make money by trading on the market of binary options. I think you can even take a look at some reviews of real traders about it. It's not very easy to trade for a living, as the income is not stable. So, it's better to have additional earnings or the main job. I think Binary options trading is much more risky than Forex trading as it is the quickest market of the recent time. You have very low almost zero margin of error or mistake. You also need to a much better money management plan here. So, it is not an easy business to earn a lot. Yes. Many people are making a living from binary options. But they have sacrificed their time and sleep in it. You have to study the fundamentals of it. Also remember that this is not your retirement fund. Anything can happen in it. Just be careful. Hey Geek, who do you trade with? Can you actually offer some GOOD advice, for a change? Instead of your usual, slagging off, everything?